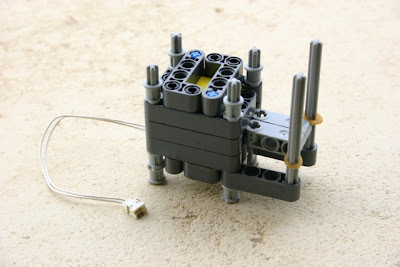 Now that LEGO decided to give us a new 'Linear Actuator', with the risk that they may replace the old nice pneumatic cylinders forever, lets take a look into a more traditional linear actuator design, electrically controllable. This design is not as compact as the new proposed part, but still effective. 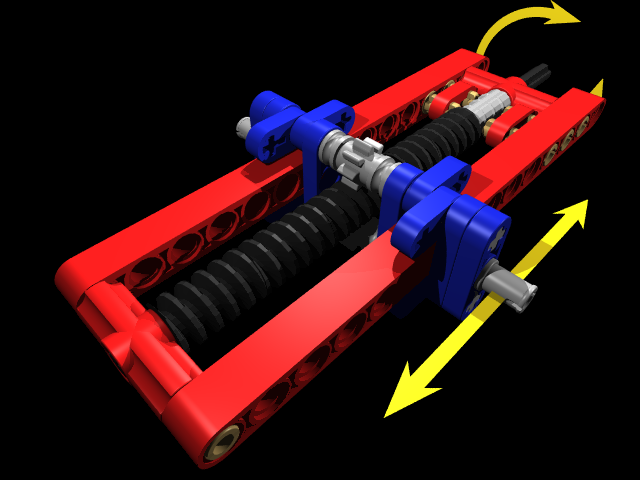 It uses a LEGO micromotor and a property of the Archimedes screw or 'gear worm screw': if you place a washer on an axle next to the screw axle, it moves it along! It is somehow limited by the most common 12 stud TECHNIC axles, but there are also newer 16 and 32 stud versions (since 2004). Main problem of this design is that half bush parts at side axles, may (will) slide under heavier load forces. This is something that can be improved by using multiple bushes, however reducing piston course and actuator range. On the left side there is another similar design, but for a longer course version, which main difference is the inclusion of higher number of worm screws. Thanks Paulo, for highlighting this design! 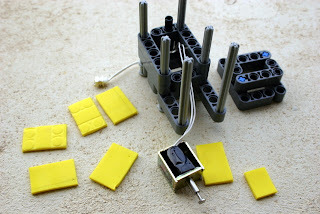 There is also an alternative that LEGO could explore for similar applications where linear movement is required, based on solenoids. However movement is very fast, strong and there is no ability to achieve intermediate positions. You can find a very good description for such an implementation, with some electronics expertise required and integration with LEGO TECHNIC parts. However for an NXT application. It is detailed described here, by Sivan Toledo, a computer Science Professor at Tel-Aviv University and also a blogger at nxtasy.org, who already found some usage from TBs here (see comments) and here. And just another NXT solenoid implementation project video. I've got an actuator design that theoretically (because I never built it for real) should work well, without slippage under heavy loads: it uses two 8-T gears instead of the half-bushes. Here is a rendering; it only uses standard pieces. A longer range of movement could be achieved with a longer axle, but I chose to use the more common 12-stud-long one. I played around with leadscrews a little while ago, and bring this warning: Since each worm gear is just slightly less than two studs long, if you are using two of them to extend your range, they may separate slightly, causing the half-bush to experience difficulties when moving from one worm gear to the other. That's why we see two half bushes at both end of these screws in second picture. Just to prevent them from separating. Avcampos's design looks great, as the gear will not slip as easily as 2 1/2 bushing. Great idea, I'll surely use it!